Should the act of purchase exclude the sense of group ownership that is so often attached to relics (I'm referring to shakuhachi here, ie. history belongs to us all) to the extent that the purchaser has the exclusive right to do what they want with the relic including altering its physical characteristics and possibly at the expense of the original maker's intention? Why and How would anyone alter a Vintage instrument ? I heard there was/is a tradition of Shakuhachi being buried with their owner, no maintaining that instrument for future community interest there ! Restoration and Repair are not the same treatment, Restoration usually maintains original materials and practices, Repair could use any material and practice that returns the instrument to use. Not all instruments would qualify as 'Museum Quality'. A Rare item may not necessarily be Vintage and vice versa. Thanks K., I suppose that alter may include repair and possibly restoration. The key is that the person doing it isn't an established pro at that and is doing it with an explorative nature...or maybe because they just wanted to. The original question was really about how historic relics may/may not or should/should not fall into public domain by some kind of default of convention. Once the shakuhachi is put up for sale on the open market, anyone with the money to buy it has and should have the right to do so and then to do with it as he sees fit, whether or not the cognoscenti approve. Assuming the buyer uses only his own money there is no group ownership of the flute, though any number of people may feel concerned about its fate. If the shakuhachi has unique historic value it may become a museum piece, possibly at the expense of the original maker’s intention. Anyone has the right to do anything they want to their shakuhachi. But that doesn't mean they should. All that can be done is to suggest possibilities and consequences. Owners do what they want. I actually like Jeff's concept of "group ownership" a lot. I might have phrased it as collective responsibility or the like... but group ownership works for me. It - of course - doesn't mean you don't own the flute totally and don't have all the rights - you do. For me it means rather that the flute does not exist in a vacuum where only the owner and flute exist. It exists in a larger context of musical and historical heritage. To alter old flute diminishes our chances to understand the past of the fascinating instrument. In some ways we have a collective responsibility to leave the old flutes as they were meant to be (especially the good ones) so we can also in the future learn about where this music came from and why it sounds this way. Restoration is necessary for it to play... that is not the problem but to change a flute to today's blowing techniques and needs - I feel - is a pity. Now, I am not the proud owner of a vintage flute - if I were - perhaps I would change my mind. But as an researcher specialising in organology... leaving the flute as it was intended is the best in my mind. If that is not satisfying, then I think it is better to buy a modern flute. The original question was really about how historic relics may/may not or should/should not fall into public domain by some kind of default of convention. Along with deciding how you can keep the historical relics from falling into the hands of a novices with inclinations to alter them, some group is going to have to determine which are historical relics and which are low quality shakuhachi that won't serve much purpose historically. It seems hard for me to believe that there is much harm altering most of the Ebay vintage shakuhachi. However, if someone purchased one of the fine flutes in Brian's, John's or Ronnie's collection and wanted to, say, drill a couple extra holes in it, hopefully they'd come to there senses before touching it. It seems to me that the best way to keep stuff like that from happening it to leave it up to the original owner to decide who he's going to sell to, and to provide some education about the instrument. Most novices would be very reluctant to make alterations on an expensive instrument, so maybe the best way to get the instruments the respect they deserve would be to price them accordingly. Then the only flutes that would be a problem would be the relatively few high end or unique historical flutes in the hands of those that don't know the value of what they own. Sorry for that troll question but what you call a vintage flute? 30-50 years old; 50-100? Or in the style they where build? I may know a teacher in Germany that build his own flutes, he is nearly 80 years old I think and he had learned to build flutes in his young ages so maybe 60 years ago and he still build flute in very old tradional way of his school I think. There have been attempts to introduce a system where Artists receive a percentage of any increase in value to their work when a re-sale is made. For the most part this has not been successfully established, partly due to a method of recording and policing and eventually legalizing. The best one may expect in the Shakuhachi community is that a seller discriminates to whom they sell a flute of historical interest. Otherwise, as with most property, the owner may do as they wish, within the law. And to that end, an ethic within the Shakuhachi community may evolve. Then one may ask, "What and Where is that Shakuhachi Community ?" That is a good procedure, but if one needs money very fast, can he/she wait until someone of the community have the money or want to buy it? Sometime ago when making my first flutes, I wanna so much to learn that I bought some of the cheap japanese shakuhachi on ebay to play and/or work on it. I have bought some, and one of these I, in my begginer mind (always) tried to turn it on a jiari. Haaaaaaaaaaaaaaaaaaaaa!!! I can kill myself when I look that flute. It arived here, I saw that the utaguchi part was missed and broked (the bamboo) and thought "I will try to make a jiari of it". In my mind, at the time, it was no problem with that because I wanted so much to learn. At the time I thought it was not a good flute. No hanko, one mark of bamboo being bent, weird bore (thought of the time: a kid looking to black bore without asking if there was nothing behind that - it looks black, its black... - a view avid to do some work didn't saw a red urushi below that. Why I didnt looked better and tried to clean it?)... but... now, after have tried to experiment making more shakuhachi and have studied more music and played some more shakuhachi, I think: "Did I have give the time to feel the flute?" So, I try to have this lesson to everything of my life. The flutes should be preserved to prevent extinction of knowledge and sounds!!! ... leaving the flute as it was intended is the best in my mind. "Did I have give the time to feel the flute?" Well put Kiku, Kel and Henrique. I've had discussions with fellow makers where we've cringed at the thought of some of our early repair attempts. In hindsight, we didn't quite get it on many levels. An ethic or sense of responsibility is something that seems to change over time and develop very slowly. It's a thorny one because you can't tell other people what to do with their flutes. What we can do is talk about it and understand each other. I'm guilty myself of altering an old flute, but I don't think it's the right thing to do. I agree with Jeff and Kiku, in that a "group responsibility" or such would be a good mentality for people who cherish this instrument. Even though my flute was cheap, from ebay, and in need at least of some repairs (crack, utaguchi chips, center joint, rings) I have some regrets about altering it to the extent that I did. I, like most other novices that find themselves with an old shakuhachi in need of some restoration or repair, had the intention of fixing it properly but made mistake after mistake and ended up compromising the integrity of the flute. However, I do love what it's becoming.. flawless black and ivory etc, but I should have probably started with a raw piece of bamboo, not a vintage flute. My biggest regret was that I was not able to preserve the hanko. Having said that, I'm not really sure if there was much historical value to my flute anyway but I still get a sense of regret when I think about how I could have had it restored and repaired, rather than altered and repaired. It was a lesson that I had to learn myself though, because I was warned by some of you here.. I learned a lot of other lessons too, on how to do repairs (I know better now, than to attempt a repair on a vintage shakuhachi of value), but I like to be able to tinker with less valuable flutes and possibly make my own with the experience I gained. The phrase is usually put ; "Use it OR lose it !" Truthfully I think it should be ; "Use it AND lose it :"
An ethic or sense of responsibility is something that seems to change over time and develop very slowly. My views have changed vastly, compared to when I bought my first shakuhachi. I was rather indignant when I was scolded for wanting to work on it myself, but can understand now the reasoning behind it. I've since become much more aware of, and sensitive to, the importance of preserving the integrity of a master-crafted instrument. I think that equally important are, making the original unaltered flute available to future generations, and respecting the original maker. I'd much rather consider myself a caretaker, than owner of my vintage flutes. I feel it's my responsibility to preserve the integrity of them while they are in my care, as they will hopefully long outlast me, to be enjoyed and learned from by many generations to come. Some years ago when Japan was a powerhouse the president of Yasuda Insurance bought Van Gogh's "Sunflowers" for $52 million. At one point he mused out loud that when he died he might have it go in the fire with him when he was cremated. You can imagine the firestorm that created. Obviously any of Van Gogh's works would be considered a patrimony by the art world. The difficulty is to determine what qualifies as a patrimony. The 35,000 year old vulture-bone flute found in Germany should probably not be altered to play A = 440, I agree, but things get less clear after that. I have flute #277 made by one of the first dai-sensei of the Tozan school. I bought it for $80 at a Tokyo flea market and replaced the utaguchi. Because the re was quite sharp (as it is on many early Tozan flutes) I had no qualms about plugging and redrilling the hole, but this was before I realized what the flute was. Knowing what I know now, would I have hesitated to retune it? Actually no, since I like the sound very much (it is a hybrid jiari/jinashi flute) and I want it playable. The real question is whether you want to put an instrument in a museum and look at it or play it. I am generally of the opinion that if you want to perform, you are much better off buying a new or recent instrument than futzing around with some vintage piece that was never intended to play in today's style. If you really, really like the sound, copy the bore and work on the clone. If it is a jinashi, though, each person has to decide whether altering the flute destroys something valuable from the past. To cut to the chase: flutes are meant to be played, not looked at. 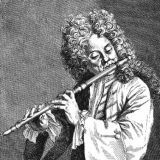 I'm not talking about taking a good vintage flute and giving it to a beginner to practice his filing technique on, but rather a studied and deliberate effort to make a good flute better. And if you think about it, isn't it worth more as John Neptune's work than as some original piece by an old maker? Some very insightful comments here and I thank you all for your contribution. Christopher B. posed the question: 'What is vintage?' I would go with the definition 'representing the high quality of a past time.' However, I also used the word relic and go with the definition 'an object having interest by reason of its age or its association with the past.' As for your 80 year old flute maker who is still alive, his earlier works might qualify if he has established a name for himself which means accreditation by a knowledgeable group. I feel that this leads to the source of the concept of group custodianship over such items and may explain in part why flutes of lesser-known, or unknown makers of equal age and quality might draw less attention and thus concern to the modern group mind if lost, damaged, altered, burned or buried. Naturally, as Toby points out, the 35,000 year old vulture-bone flute falls into a completely different category that we may even attribute something miraculous to. We tend to identify such things with awe and the thought '...look at what we did so long ago!...yes, we're okay.' A kind of justifying pat on the back for humanity. I would agree with you there Toby, however I think that we're talking about two different beasts there. An excellently playing flute as compared to a flute that is old and respected for some reason, though not necessarily its playability. At any rate, this might be a good follow-up topic: What do we value in a shakuhachi and why? Funny that the old bone flutes were mentioned. I was just at the Museum of Natural History with the kids and saw some replicas in the Human Evolution section. The top one is labeled c50,000 years. The bottom, c34,000 - 32,000 years. Next to the display were the Neanderthals of that era. Blew my mind to see what the players may have looked like back then. He certainly looks like a shakuhachi maker to me! I spend a lot of time with old, antique flutes. I consider myself very lucky to be able to have deep conversations with the past makers. They are portals to the past. It would be a crime to knowingly destroy their work. I spend a year or more on my Yung Professional models. They do exactly what I want them to do. They are not perfect for every player, but they are exactly what I intend. If in 80 years from now, a person of another culture comes into ownership of one of my flutes and decides to carve on it because the Chi is too sharp and the flute does not play at A=446hz (or what ever it will have risen to in 80 years), I will rise from the grave with my spear in hand! Yeah, I've had a few Neanderthals visit me in my dreams, waving shards of flint and still wanting to make adjustments. The real question is whether you want to put an instrument in a museum and look at it or play it. I am generally of the opinion that if you want to perform, you are much better off buying a new or recent instrument than futzing around with some vintage piece that was never intended to play in today's style. I complete agree. If one's approach is to play today's music, buy a new flute and support a living maker. I didn't start retuning flutes until I worked with Kinya. The experience gave me a deep understanding and respect for the traditional Japanese craftsman. Prior to that, I only repaired cracks by non-invasive topical bindings. In America, because our history is so comparatively short, we can not understand the depth of importance the Japanese hold for their traditional craftsmen. Yes, both offer immeasurable gifts to the world in different ways. I would choose John's flutes right away in a live ensemble music situation, but would prefer to hold an old flute for a glimpse into the world of the maker. At any rate, this might be a good follow-up topic: What do we value in a shakuhachi and why? Looks like he's using mono filament? Doesn't seem authentic for that era. Thanks for the belly laugh Derek!